At last, a finished Object. I named this sweater "Dreaming of Spring" because of its spring colors, and because it is a warm sweater that I was knitting in February. I intended to wear it through the spring season, which ended up being quite long, but instead I set it aside and forgot about it. It is a blended sweater, knit with two strands of yarn on size 19 needles with a gauge of 1.75 stitches/inch. I had a Colinette kit for a throw, which I had purchased long ago, in colors that blended with the decor in my family room. It never got made. The family room has changed slightly, and I am no longer interested in the throw. I love the yarns but they were not the most flattering colors (yellow greens with some pinks and purples). A couple of days later I went back to the yarn store, kit in hand, and the Tagliatelli was still there. It looked like a good combination. I ended up buying another Colinette kit as well, dismantling both kits and grouping the yarn into selections for two sweaters, each one using yarn from both kits. I worked out a sequence for the yarns that appeared attractive to me. The sweater is knit with one skein of mohair throughout, the other skeins are rotated. There are actually two shades of green mohair: one yellow green and one a blue/gray green. (I called them yellow moss and blue moss.) One stripe is knit with both skeins of mohair, making a transition between the blue and yellow mohair stripe sequences. Then I just started knitting, having a rough idea in my head of what I wanted. I decided on the length, took a few measurements (waist, length from hip to waist, length from waist to underarm, etc). I added short row shaping at the bust to make a dart, and so that the stripes wouldn't get all wavy and wonky on me. In the photo on the right the sleeves have been pushed up to elbow length as it was much too hot today for even a loosely knit mohair sweater. I think it turned out quite nicely and I am looking forward to being able to wear it. 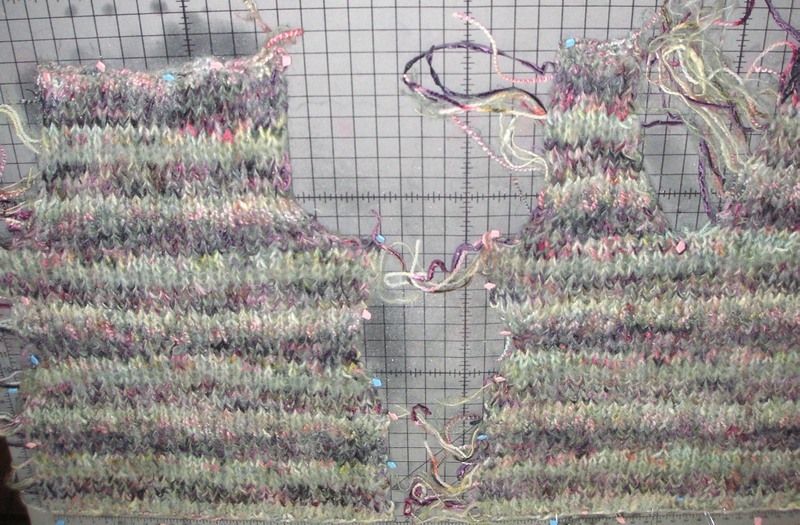 I am finishing up the green and purple mohair/blended sweater called "Dreaming of Spring". It really just needs sewing up and weaving in. I've said it before, but blended sweaters require an awful lot of weaving in of loose ends. I don't mind doing it, I find it kind of relaxing, much the same way I find sitting and weeding relaxing. Yes, I know, tell me I am cracked. Anyway, I will take this with me today, but I don't think I will be working on it while sitting in waiting rooms during DH's appointments -- it is just too hot out. But I will take it with me to knitting group tonight. I might even work on it. Dreaming of Spring is what I named the stripy green and purple sweater I am knitting from the mixed bag of Colinette yarns. It is really a winter sweater but the colors just sing to me of the promise of spring. I've got the body on the blocking board and the sleeves are almost done (about 1/2 sleeve to go). I haven't really decided how I am going to finish the neckline yet, or which yarns I am going to use. I am planning on adding some decorative touch at the bottom of the sleeves as well, but haven't planned that yet either. It is all kind of a guessing game and I just hope I like the finished sweater, but I love looking at the knitted fabric as I go along. It is just so pretty it always makes me smile.